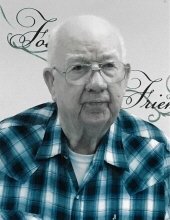 Edward Byron Ball, 80, of Moss Point, MS, went to be with the Lord on Monday, July 30, 2018. Ed was born on April 3, 1938 in Leakesville, MS. He was a member and longtime deacon at Escatawpa Baptist Church. He was a veteran of the United States Air Force, which stationed him in Albuquerque, NM, where he met and married the love of his life. His hobbies included growing a large vegetable garden, that he shared with friends and family, and building wagons for lots of children. He was known as the “Candy Man” by all the children he came in contact with, but his love of picking up his great-grandchildren is what he loved the most. Ed was preceded in death by his parents, Forrest and Eliza Ball, along with several sisters, brothers, nieces, and nephews. He is survived by his loving wife of 57 years, Shirley Friberg Ball; children, Susan (Steve) Goff and Steven Ball; grandchildren, Russell (Kimberly) Goff and Kara (Kelly) Clark; four beautiful great-grandchildren, Russell Goff Jr., Kathryn Goff, Karson Clark, and Karley Clark; brothers, Reubin (Freddie) Ball and Joseph (Darleen) Ball; sister, Bettye Ball Hillman; brothers-in-law, George (Mary) Friberg, Robert (Barbara) Friberg, and James (Jane) Friberg; along with several nieces and nephews, and special friends, Mike and Linda Turner. The family would like to thank Dr. M. Zayed and his staff for the loving care they provided to Ed. The visitation will be held on Thursday, August 2, 2018 from 9:00 a.m. until 10:00 a.m. at Heritage Funeral Home in Escatawpa, MS. The funeral service will follow in the funeral home chapel beginning at 10:00 a.m. with Bro. Matt Morse officiating. Interment will be held at Serene Memorial Gardens with the deacons of Escatawpa Baptist Church serving as pallbearers. In lieu of flowers, the family has requested that donations be made in Ed’s memory to Escatawpa Baptist Church Bell Tower and Roof Fund, P.O. Box 725 Escatawpa, MS 39552. Heritage Funeral Home, locally owned and operated, in Escatawap/Moss Point, MS is in charge of arrangements. To send flowers or a remembrance gift to the family of Edward Byron Ball, please visit our Tribute Store. "Email Address" would like to share the life celebration of Edward Byron Ball. Click on the "link" to go to share a favorite memory or leave a condolence message for the family.